TimeZone : Jaeger-LeCoultre » Should I trade my Grande Date for a 976? Just saw today this black face 976. I like the 976's larger case and it been thinner (the case of the Grande Date has always felt a tad short). On the other side, I like the Grande Date's complications and face, which makes it feel special. Not sure what to do. Views? The 976 is a very nice watch, if you hardly wear the Grande or you feel you won't miss it that much then i think you should trade. You could still go ahead and keep both watches for yourself. 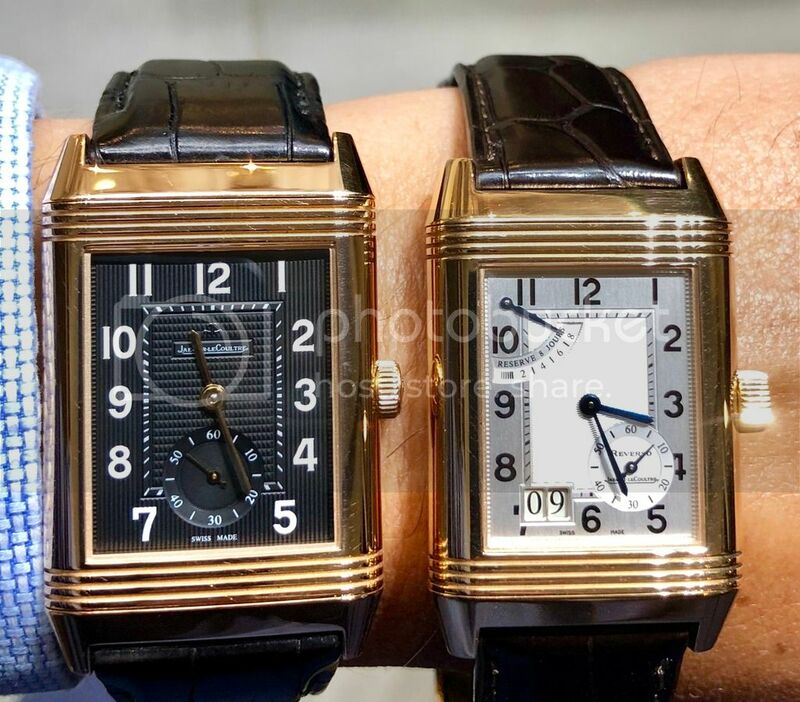 ...... the 8 days PR and big date is something I cherished a lot in these early Reverso. The only attribute of the 976 that I like better is the thinner profile and if that is what attracted you, perhaps the TTR 1931 is a better choice being ultra-thin and classic cleaner dial. If it were mine, I'd keep it. And I think it looks great on your wrist too. I understand the uniqueness of the black dial face, I have the Duo in rose gold and it is nice to switch. The consensus is the Grande Date is the superior watch, which is true but it only matters what you want. When wearing my Duo, I find about 90% of the time I have the white dial face showing. They are both beautiful watches. That and the grande date are enough to sway me. a distance photo (50-80cm) will give abetter perspective how each looks on you.